31 Thursday January 9th 1896 It was such a lovely day. Robbie and his Mother were out to spend the day. We had such a good visit. Will went to Smith Bradleys sale. Seth went to the valley early, took a load of wood to town and brought one home from there in the afternoon. I worked on my mat all afternoon and evening. Friday January 10th 1896 I was busy about the work all forenoon. I had dinner before it was late. Seth took a load of wood to town from the valley. Will sold three steers to Mr. Struble and I got his dinner after we had ours. We then went down to Stevens for a ride and took Uncle Jim some cider. We came home to do the evening work. Seth went to help Mr. Strubles home with the steers. 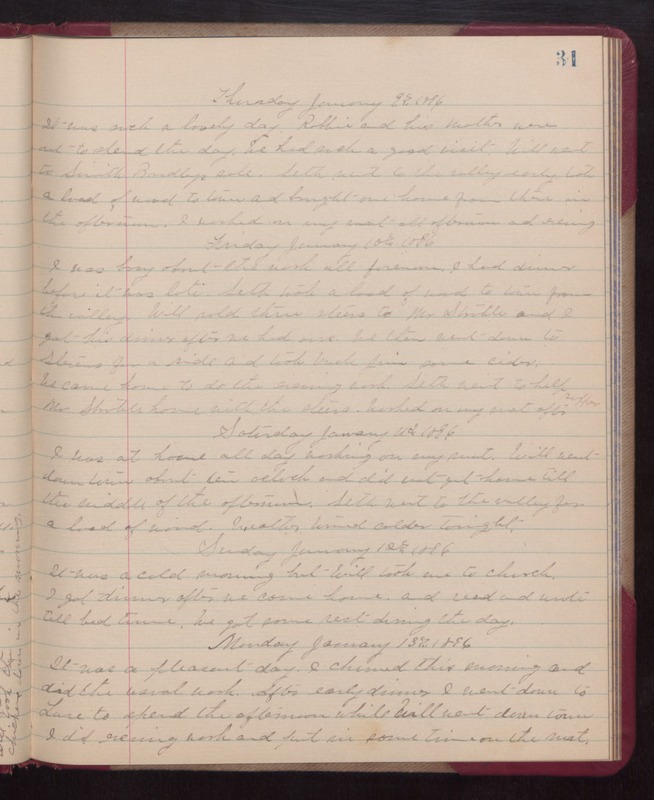 Worked on my mat after supper Saturday January 11th 1896 I was at home all day working on my mat. Will went down town about ten oclock and did not get home till the middle of the afternoon. Seth went to the valley for a load of wood. Weather turned colder tonight. Sunday January 12th 1896 It was a cold morning but Will took me to church. I got dinner after we came home, and read and wrote till bed time. We got some rest during the day. Monday January 13th 1896 It was a pleasant day. I churned this morning and did the usual work. After early dinner I went down to Luse to spend the afternoon while Will went down town I did evening work and put I some time on the mat.